Last Sunday night my wife and I were watching television and saw weather alerts on our local channels advising the threat of severe weather including possible tornadoes. The warnings are not atypical – however fortunately Delmarva does not experience many tornadoes. I have lived here for more than thirty years and have heard of maybe two or three. Needless to say, my mind was filled with more thoughts about the Game of Thrones episode I had just watched than thoughts of tornadoes. At about three am we heard our cell phones blast a tornado warning advising that everyone in the area seek shelter. My wife got up and began to poke and prompt me to get out of bed and seek a safer place to shelter. I still did not take it or her seriously and simply rolled over and tried to get back to sleep. My wife gave me hell for being so lackadaisical and we laid in bed and heard the storm. It was very intense; but fortunately we were not in any danger zones and faired with no damage or injury. However, when I got up the next morning and turned on the local television channel I saw that there had indeed been a tornado. About twenty miles west of our home in Lewes an EF2 tornado touched down near Laurel and tore a path of destruction about 100 yards wide and over ten miles long. It was not until I drove from my office over to Laurel to see the damage first hand that I began to scold myself for my stubbornness and my stupidity. Homes were obliterated, trees uprooted, roofs missing and debris was everywhere. Small and large structures shared the same misfortune and many families lost almost everything. I kept thinking over and over – THIS COULD HAVE HAPPENED TO US! My laziness and ignorance could have placed the life of my wife and our beloved dog in harm’s way. What made my guilt even worse was the thought that there is no excuse – I was given plenty of warning. The fact that there were no deaths or injuries from the storm told me that others had in fact heeded the timely alerts. Fortunately, I may have been the exception and not the rule. The moral of this story is rather obvious – Pay Attention and Heed Warnings of Danger! If you suffered any storm damage – please call SERVPRO of Sussex County and we will be happy to assist with the clean up. Don’t Mess With The Mess of A Sewage Spill! Sewage spills can be caused by a number of issues at your home including broken pipes, blocked plumbing and damaged septic systems, or by intrusion of contaminated flood waters. Sewage contains harmful microorganisms such as bacteria, viruses and parasites. Direct contact with sewage or surfaces contaminated by sewage can result in illnesses such as gastroenteritis, infection and other diarrheal concerns. These types of illness may be violent and extremely unpleasant; but other pathogens can lead to death. If you have had such misfortune occur in your home – First – Call SERVPRO of Sussex County! Next take steps to minimize any exposure to people or pets from the sewage. Our team of professionals will arrive quickly and offer a plan of remediation that will ensure the safety of all involved. They will remove the sewage and contaminated soil form under the house. This is the first step in the decontamination process. Any and all surfaces or items which have been in contact with any sewage must be thoroughly cleaned and sanitized. Once the area has been decontaminated; typically a vapor barrier will be applied. Pepperoni and Extra Cheese.....No Mold...Please! Pepperoni and Extra Cheese……Hold the MOLD….Please! The restaurant business is tough enough under normal circumstances. Every customer must be satisfied in this digital age….or else they will start YELPING or worse! The challenges of labor, perishables and meeting standards of service can be overwhelming. I truly admire those who succeed in this arena. Like most of us; however, restaurants are not spared the everyday emergencies and disasters that are common in daily life. Broken pipes, rain water intrusion and even fires can incapacitate a thriving eatery. 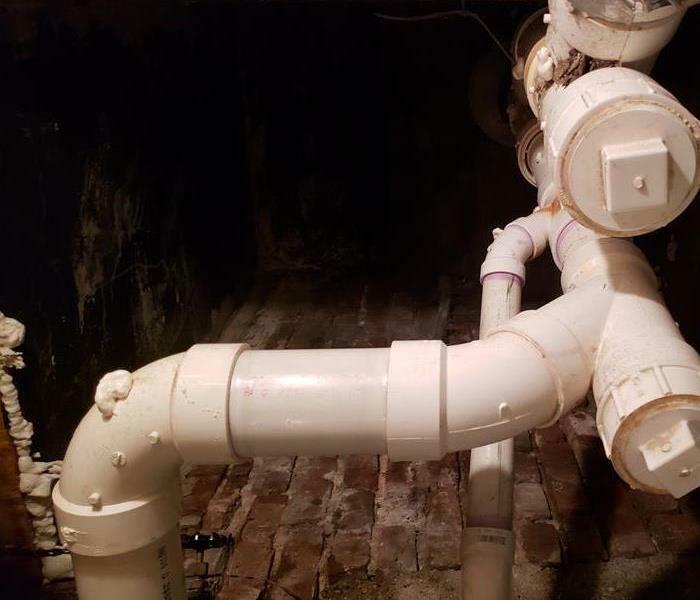 Recently, a popular local pizzeria called us with concerns about growth which their HVAC service provider discovered in an area by the kitchen. The proprietor was naturally concerned about the health of her patrons and staff and wanted us to remediate the situation as soon as possible. She also wanted us to do the work without disruption or distress to her dining public. It is situations like these that test the flexibility of our efforts since she wanted us to take care of the issue during non-working hours. She also requested that our technicians stay out of sight if the work should spill over into lunch hour. We understood her reservations and obliged with a thorough and rather stealthy approach and we had the situation contained and corrected within only a couple of days. She was extremely pleased and bought our crew a pizza as a gesture of her appreciation and kindness. She exhaled a big sigh of relief upon completion of this job. Our professional team here at SERVPRO of Sussex County genuinely makes a sincere effort to consider the concerns of the property or business owner. The crew worked quickly enough to satisfy the patron and stayed under the radar so as not to cause further worry to her and her customers. This was truly a scenario of……. "Like it never even happened." Respect and Inspect Your Ducts! A duct inspection is important for quality indoor air, lowering energy costs and locating possible problems before they become costly ones. Consider performing a duct inspection with SERVPRO of Sussex County in the spring and fall when you change over from heating to cooling your home. Lack of cooling or heating: Check for worn or torn insulation in unconditioned areas, such as attics, crawl spaces or basements. Rattling noise: Possible loose joints in the ducts. Air volume low: Possible presence of cracks or holes. Sagging ducts: Hangers holding up the ducts may be loose. Foul smell coming from ducts: Possible moisture, mold or mildew presence. Although you can do small repairs like replacing insulation it is best to contact SERVPRO of Sussex County to perform an extensive ductwork inspection and evaluate the condition of your ductwork. We will determine if your ducts are damaged or if replacement is necessary. SERVPRO of Sussex County has the most advanced equipment to inspect and clean ducts. Call us today! SERVPRO of Sussex County…….Not just a Job – It’s an Adventure! I have worked in the business arena for more than 35 years. I have sold everything from poultry to legal services. Although those endeavors were challenging and offered their own specific types of rewards; the work was not typically exciting and at times it was routine at best. My time with SERVPRO has been exactly the opposite. Each day brings new challenges and most offer opportunities to make a real difference in people’s lives. The critical nature of the events which truly require the SERVPRO expertise and service makes every job important. When an individual or family is displaced due to a water or fire emergency; the work is inspired by a heightened sense of urgency and the vocation to help others takes over. Getting that family back into their home becomes the goal and the team comes together to solve the problems. In a sense; it almost feels at times like we are “second” responders and although the situation may not be life or death; the rewards are genuinely fulfilling. The dramatic times may not be appealing in any job. In most cases the everyday mundane theme of the workplace can be affected. Real human drama is very different. The images that we see on an ongoing basis inspire such compassion that the effort takes on a nature very different from the routine. The scene at a burned out or flooded home and the sight of a pile of charred or saturated possessions can inspire not only emotion but intense energy as well. This emotion and energy become the true vocation that is SERVPRO – problem solving in a crisis. Another example would be when a natural disaster effects our area or another and we mobilize simply out of the desire to help! If your job is becoming “boring” and less than challenging – stop by our shop and complete your application today! One of the principles of Murphy’s Law is timing. The common phrase is: “If something can go wrong it will; and usually at the worst time.” A commercial water loss can be catastrophic enough at any time; however when it happens during a very busy time – a great deal of worry and anxiety will usually come with it. Under this scenario; the situation can be further exacerbated when the business affected is a hotel with a sold –out weekend upon them. Recently, SERVPRO of Sussex County responded to this exact event which occurred over the President’s Day Weekend. It must be stated that the beach area in Sussex County has become a year round destination and when travelers have a three day weekend to enjoy here; they make the most of it. Hotels usually sell out weeks in advance and visitors take advantage of local shopping and dining. The call came around two am on a Friday night and we dispatched our crew to the scene within two hours. We found that an HVAC unit on the third floor had a broken hose and water flowed for several hours into the walls, floors and ceilings on three levels affecting about twenty rooms. Our crew acted quickly to extract as much water as possible and begin the drying process. They were on the scene for more than twelve hours on the first call. We found a very worried manager who naturally was overwhelmed with not only the damage to the hotel but with the thought of those twenty to forty guests arriving with the possibility of no accommodations. In this case, any reputable hotel will do exactly as this one did – re-locate the guests with a complimentary stay at another hotel. Hospitality should be extended even through the challenging times. Although, some guests may have some disappointment; at least the entire weekend was not lost. When an emergency strikes at the most inopportune time – call SERVPRO of Sussex County and we will offer prompt response and make order out of chaos – "Like it never even happened." Is Your Health Care Facility Healthy? Sussex County has hundreds of professional health care facilities as well as doctor’s offices. We are fortunate to also have Beebe, Nanticoke and Bayhealth Hospitals in our area. Healthcare is not only a major industry in Sussex County but also in our entire state. It is an industry that generates thousands of jobs and billions of dollars in revenue. SERVPRO of Sussex County has served many of these practices over the years and we are proud to play a part in keeping the health care industry clean and healthy. Some of the issues we have addressed over the years include: water damage, growth and mold remediation, bio contaminants cleanup, duct work inspections and duct/vent cleaning as well as full scale cleaning services which cover carpets, floors and upholstery. The goal of every practice is to maintain a location that not only has a healthy appearance; but exudes cleanliness and a sanitary environment. One of the first things that most people notice about any office is the smell. SERVPRO of Sussex County can locate the smelly source and return the office to a non-offensive state. Whether it is a dead rodent in your wall or mildew smell from a water or moisture issue – we have the skill, products and tools to correct the problem. Even a minor water issue can create a lasting stench and we tackle the smell at its source – we don’t just cover it up. Almost every health care office has experienced issues of biological “spills”. Whether it is urine or blood; we can clean and sanitize so no contaminants will worry the future patrons. We take these types of jobs very seriously and want to make the goal to each situation “Like it never even happened.” Call us today at 302-856-9768 or visit www.SERVPROsussexcounty.com. Almost as Fast as a Flash Flood! This photo shows the area in the basement where the ground water entered through the foundation. Recently, a friend, who is also a local contractor called to inform me that the office which he was leasing had experienced a water loss the day prior. The Lewes area had experienced an extreme downpour and it forced groundwater through the foundation into the basement and ground floor. It just so happens that his small office is located in the ground floor of a landmark home located on the Lewes canal and he was concerned about the effect the flooding would have on the entire home. Obviously, this home is worth over a million dollars and his concern was valid. Within an hour of his call, the SERVPRO of Sussex County team delivered dehumidifiers and air movers to the location and the drying process began. In hindsight, it was very lucky for this homeowner that someone was present at this location and was able to address the loss immediately. If the flood water had been left unattended for days or weeks – growth and other additional loss may have occurred. This absentee owner issue is a real concern for many homeowners in our area who also dwell outside of Sussex County. SERVPRO of Sussex County recommends that if you do not have a neighbor or caretaker to offer periodic inspections of your property; you may want to consider a property management team to do the same. This story has a happy ending primarily due to the quick reaction by both my friends’ crew and our SERVPRO team in response to the loss. After a several day drying process the moisture levels were reduced and the home smelled normal again. I met my friend at the location and he showed me a video that he took of the flooding. Many people are startled by how fast water travels. Fast reaction and response time is what separates SERVPRO of Sussex County from our competitors. If you need us – call us today! For SERVPRO of Sussex County – It’s Community First! SERVPRO of Sussex County takes a great deal of pride in the community we serve. For more than 25 years we have offered restoration and remediation services to the local public and we have offered response and support to some of the area’s most challenging events. This is our role and we take it very seriously. But when it comes to caring for our community – fulfilling our role is simply not good enough. We have all heard sayings like “pay it forward” or “do the right thing”. In a sense these words express a higher call for duty in our community to give and go beyond what is simply expected. SERVPRO of Sussex County embraces this role and we make good on our ongoing promise to give back to those in need. Our charitable efforts in 2018 included donating time and or resources to the most worthy causes in our local area. We are happy to have offered our support to such groups as Habitat for Humanity, Breast Cancer Awareness, Substance Abuse Awareness, Fire Prevention, Special Olympics and CHEER. We also support the local Boys and Girls Clubs and our areas police, EMS and fire departments. SERVPRO also donated to several local food drives. As a community we must not ignore the needs of the community. We encourage all local businesses to take strides to effect more than just their bottom lines and put their neighbors first. At SERVPRO of Sussex County we always ask ourselves – Can We Do More? Fulfilling our role is important; yes – but becoming a Role Model is more so. SERVPRO of Sussex County - Go With What You Know! Sussex County Delaware is currently experiencing growth at a more rapid rate than at any time in its history. The Cape Gazette recently ran a story on this boom and offered some staggering statistics. There are over 11,000 lots or units under projects or plans for construction. More than 350,000 square feet of new commercial space has been approved or under review. Schools are expanding, new hospitals are being built and new large medical centers are planned or under construction. There are plans for 5 new hotels offering an additional 430 rooms. It has been said that 5 out of every 6 people moving to Delaware are relocating in Sussex County; with an estimated population increase of more than 15% within the next five years. SERVPRO of Sussex County has been a steady fixture in our community for more than 25 years and we view this growth with optimism. However, with all of the new construction, we are seeing new service companies in our area that are attempting to profit from this growth. Almost every day, we encounter a different or new “specialist” offering similar services to our community. We have heard and witnessed accounts of poor service and workmanship and we are concerned that these “bandwagon” companies will leave local patrons feeling less than satisfied as they focus on quantity of work instead of quality. Where we offer free inspections – we are seeing many competitors charging for the same services. We encounter efforts to discount and or buy business away from us; or companies which tout abilities and experience that is simply false. Most of these predatory competitors are not even located in Sussex County and none offer the expertise or experience that SERVPRO is known for throughout our nation. We encourage our local patrons to go with what they know and most know that SERVPRO is the most respected and trusted remediation / restoration provider in our area. So we say – Let the buyer beware. SERVPRO of Sussex County has a true commitment to excellence in our community because this is where we work and live. Trust local business to serve local business and residents. 4/22/2019 - Please Don't Ignore Tornado Warnings! 4/15/2019 - Don’t Mess With The Mess of A Sewage Spill! 4/8/2019 - Pepperoni and Extra Cheese.....No Mold...Please! 4/1/2019 - Respect and Inspect Your Ducts! 3/25/2019 - SERVPRO of Sussex County…….Not just a Job – It’s an Adventure! 3/18/2019 - Wet, Winter Weekend Worries! 3/11/2019 - Is Your Health Care Facility Healthy? 3/4/2019 - Almost as Fast as a Flash Flood! 2/25/2019 - For SERVPRO of Sussex County – It’s Community First! 2/18/2019 - SERVPRO of Sussex County - Go With What You Know!